I’m know I’m a bit late in this, but thanks for posting, and thank you for all the updates on the Idle Queen. What a legend,a true doer and not just a talker,im sure thats what gave him his long and fruitful life filled with adventure that most only dream of,what a wonderful legacy . Hash tagging Harry on Instagram. What a strange day, to learn of his death only hours after reading a beautiful note from Florence Russell tonite at dinner, sent upon the passing of our Dad, Juan Morales. Now it’s our turn to pen condolences. We can only hope to do half as well as the Heckels at both writing well & living well. I first heard about Harry at our church’s men’s group about 5 years ago. 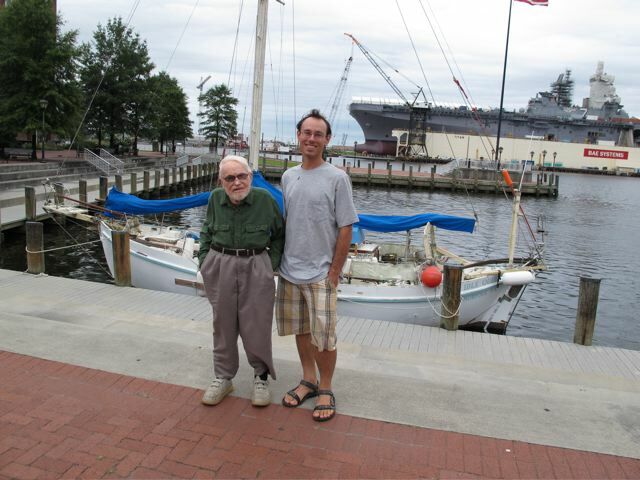 Carl (his son) came in one Saturday morning several years ago, visibly worried and mentioning that “he had to go take the keys to the boat from his father before he sailed around the world again.” The words just didn’t compute… father… sailed around the world… again? Carl was talking about retirement. If he even had a father, surely the gent was already in a nursing home. Well it turns out I was wrong. Harry had gone around twice since he retired and (at age 92 or 93) had mentioned doing it again. I then heard all about this man’s adventures and had a wonderful time reading the book last year. I was Googling the boat’s name when I came across this page. Thanks for posting the sad news. Sad to read of Harry’s passing. His seems to have been a full life well lived.